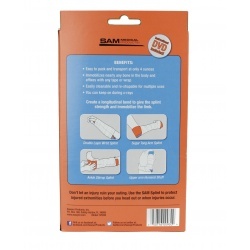 Built from a thin core of soft aluminum alloy sandwiched between two layers of closed cell foam, the SAM Splint bends into any of three simple curves to give the splint strength to immobilize a fractured or injured limb. It’s extremely moldable and soft enough to cut with standard scissors, and a single splint immobilizes nearly any bone in the body. 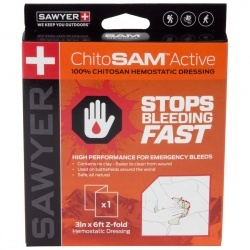 Lightweight and easily packable, it’s a must-have for your backcountry first aid kit. 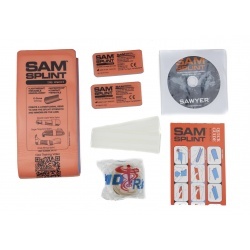 The waterproof SAM Splint is designed to be cleaned, flattened or rolled, and re-stored after use. 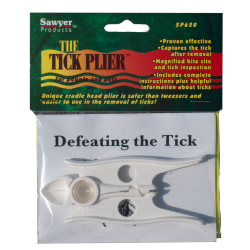 It fastens in place with tape (included) or a wrap of choice (not included) — no extra equipment is needed. 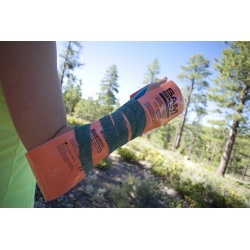 The SAM Splint is based on an ancient construction principle: curves are strong. The same physics that allows skyscrapers and bridges to be built of I-beams and hollow columns (rather than heavy steel pillars) makes the SAM Splint strong. 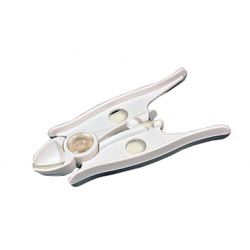 Constructed of aluminum and closed cell foam, the SAM Splint bends easily like a flat piece of sheet metal. You can mold it into any of several “structural curves” to make it more rigid. Many such curves are possible, but you only need three basic curves to effectively immobilize bones — the C-Curve, Reverse C-Curve, and T-Curve. 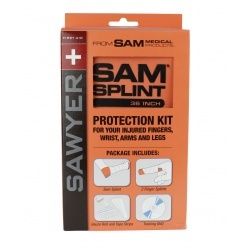 The SAM Splint Protection Kit comes with one 36-inch splint and two finger splints. 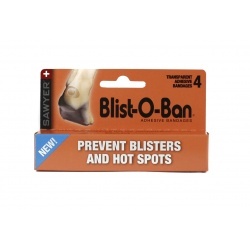 It’s also available in separate standalone Regular and XL size packages and as a single finger splint. The lightweight SAM Splint rolls compactly or folds flat, making it perfect for loading into your backpack. 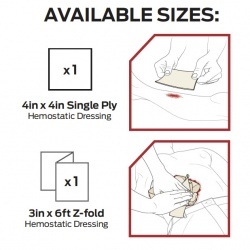 The standard size splint measures 4.25 x 36 inches and weighs 4 ounces; the finger splint measures 1.8 x 3.75 inches and weighs 0.2 ounces. Flexible in application: One device immobilizes nearly any bone in the body, affixes with any tape or wrap. Reusable: Wipes clean and is easily re-shapeable for another application. 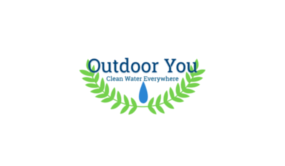 Also available in stand alone Regular and XL Size.